Sergey Shipov introduced today’s game by saying we needed a Terminator to deal with Hikaru Nakamura’s run-away tournament lead. His opponent, Magnus Carlsen, proved up to the task, winning in devastating style after a tense middlegame phase in which it was never fully clear where exactly Nakamura went wrong. Sergey Shipov’s original commentary in Russian can be found at Crestbook. 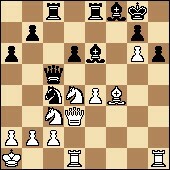 1. e4 c5 The Sicilian Defence. Nakamura hasn’t decided to play it safe. He wants a battle. A warrior! 2. Nf3 d6 3. d4 cxd4 4. Nxd4 Nf6 5. 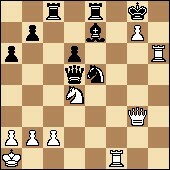 Nc3 a6 The Najdorf. Perhaps we’ll see a continuation of yesterday’s game between Carlsen and Anand? 6. Be2 No. Magnus surprises us again. 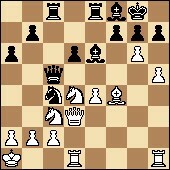 6…e5 The most aggressive move. 7. Nb3 Black has weakened the d5-point – but exiled the white knight to an unpromising position. Well, now it’s up to Magnus to have his say. 9…Be6 The standard response. A new defender of the d5-square replaces the old one. 10. g5 No sooner said than done. The delays in the American grandmaster making his moves suggest that he in no way expected to encounter the given line at the board. That means the Norwegian has won the first stage of the duel – he’s the first to spring a surprise. 10…Nfd7 Of course. The retreat to e8 is also frequently encountered, but I wouldn’t play that way even if threatened with a firing squad. 11. h4 Carlsen’s simply in a ferocious mood today! He wants to drive on and rip things apart. 11…Nb6 Black’s again taken control of the key d5-square. It seems that the second knight will come to d7, and then the rook to c8. A sensible system. There’s also the classical idea of advancing the a6-pawn. For the first time in the game Magnus has started to think… Clocks: 1:29 – 1:26. The attack’s all well and good, but you can’t forget about development. It’s important to bring the a1-rook into the battle – then it’ll be possible to attack without looking over your shoulder. 12…N8d7 My premonitions didn’t fail me. One black knight keeps an eye on the d5-point while the other – and this is very important for such structures – is always ready to switch guard duties with him. 13. f4 An entirely logical move and… a novelty! 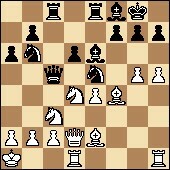 13…exf4 It would be fatal to allow the enemy pawn to get to f5. An excellent changing of the guard on e5. But… You know, there’s one way in which the knight is inferior to the pawn – it doesn’t control the d4-square, via which the passive b3-knight might go on the attack – let’s say, to f5. 15. o-o-o Development is complete. Everything’s prepared for decisive actions… Or almost everything! I’d still move the king to b1, and only then rush into battle. 15…Rc8 Black isn’t taking his time either. His knights will soon invade on c4. 16. Kb1 As you can see, I’m not alone in my prejudices. This prophylaxis is a sign of good taste in the Sicilian Defence. In the beginning it’s not always clear why it’s played. Much later it turns out that it’s precisely with this move that White avoids many troubles. 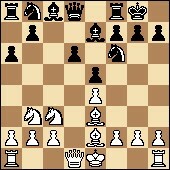 For example, the black queen taking the c2-pawn is only check, and not mate. There aren’t any unpleasant stings along the c1-h6 diagonal. And so on. Let’s look at the clocks and admire the quick play of the opponents: 1:17 – 1:11. They’re acting much more practically than Grischuk usually does. His time trouble is our mutual pain. 16…Qc7 Nakamura is waiting for a convenient moment to invade. 17. h5 An extremely aggressive choice, but I’m not sure this advance will lead to success… Black’s counterchances are no less weighty. And then, what exactly is Black being threatened with? The opening of the f-file after the g5-g6 push? That’s double-edged… One of them is that the f8-rook and e7-bishop will stop being idle. Another standard rearrangement for an experienced Sicilian player. The passive e7-bishop is rushing to become active on g7. Or at least not to interfere with the operation of its own rook. 18. Ka1 Prophylaxis squared! Now taking on c2 won’t even be check. And the black knight jumping from c4 to a3 will only make people laugh. 18…Bf8 19. Nd4 Now there’s something! It seems Magnus was obsessed by the idea of activating the b3-knight. The b2-pawn, as I understand it, will be taken care of by the d1-rook, which will switch to b1, if need be. Or you can boldly play b2-b3! If you can, then we’re witnessing the birth of a new plan in a standard position. 20. g6! And there’s the first blow at point-blank range! Hand-to-hand fighting is beginning. The f7-pawn, it seems, is overloaded with responsibilities. It needs to keep an eye on the bishop – which is in trouble from the white knight – and to protect the g6-point. It seems the advance of the white pawn was an unpleasant revelation for Hikaru. He’s having a long think. The clocks show: 0:45 – 0:45. 20…Nec4 I agree. The best way to defuse the g6-pawn is to pay no attention to it. Taking on f7 or h7 isn’t a direct threat to Black. 21. Bxc4 You have to reduce the headcount of black knights in order not to allow a blow on b2. Note that for now the pawn remains on g6. The question of what to do about it is for the future. The queen remains close to its borders – keeping an eye on things, defending. It’s perhaps time to sum up this fighting opening, which grew into an enthralling middlegame – White’s chances are greater. He’s the first to start an attack, and has everything under control in the centre. The American grandmaster perfectly understands that the situation is changing, and not in his favour. Therefore he’s stubbornly looking for the most accurate move order. Time trouble isn’t far off: 0:44 – 0:31. Note that the bishop on f8 has remained passive. If it had stayed on e7, then it would now be possible to bring it out to f6. The move Be7-f6! is Black’s standard reaction to the g5-g6 prod. Tempos in such positions are worth their weight in gold, so I wouldn’t recommend the manoeuvre Bf8-e7-f6. It’s very unlikely to work. 22…fxg6?! A mistake, it seems. 23. hxg6 Letting some of the advantage slip, it seems. Now Black again has some hope. However, here as well it looks good to exchange on e6 with Qd3-h3! to follow. The sacrifice of the g6-pawn (which is no longer what it once was) should again pay off. 24. Qg3 No, the idea wasn’t spotted. Well, the players don’t have much time left (0:35 – 0:20), and it’s a complex position. 24…Qb6 It’s essential to check if your opponent will miss mate-in-one. 25. Bc1 He saw it! White’s advantage is still undeniable. The black king doesn’t look at all untouchable. There are many ways of getting to it. The h6-sac isn’t yet an option. First some sabotage on the white squares is called for, as after all the e6-bishop can always be exchanged. 26. 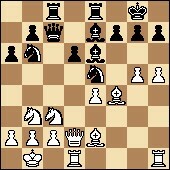 Rdf1 But the move he made was superb and also leads to victory. 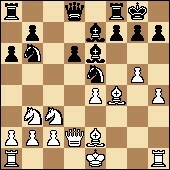 White’s threats on the f-file, in conjunction with the knight coming to d5 and the bishop sac on h6, are irresistible. By the way, it’s perfectly clear now that the black queen’s voyage to a5 was fruitless and even harmful. It didn’t create any concrete threats, and the d4-knight no longer needs to be protected. 26…Ne5 Admitting the fruitlessness of his knight’s attacking efforts. 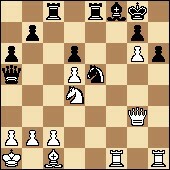 Yes, Black finally creates the threat of a blow on c3 with mate on a2 – but it’s too obvious to go unnoticed. 27. Nd5 Young chess players are extremely stubborn people. First Hikaru rejected the knight move to c4 for longer than he should have done, and now Magnus as a matter of principle is rejecting the obvious exchange of the bishop on e6. The only thing you can say to defend him is that the move in the game is also very good. Now the Bc1xh6 blow with g6-g7! to follow is looming. Then the black king will be completely defenseless. A third factor is inexorably entering into the struggle – the clocks, which show: 0:10 – 0:09. 29. Bxh6! …which is no longer any secret for us. White is winning with a direct mating attack. The black king has been condemned. There’s no salvation. 31…Nf7 Hikaru can’t believe what’s happening – he’s playing on to mate. 32. Qg6! Magnus is merciless. He’s conducting the dramatic attack at lightning speed and with extreme accuracy. 35. g8=Q+! Rxg8 36. Qxf6+ Ke8 37. Re1+ Putting him out of his misery. 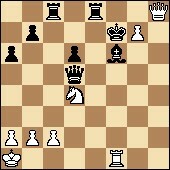 And here, facing the choice between mate-in-one or giving up his queen – Nakamura RESIGNED. 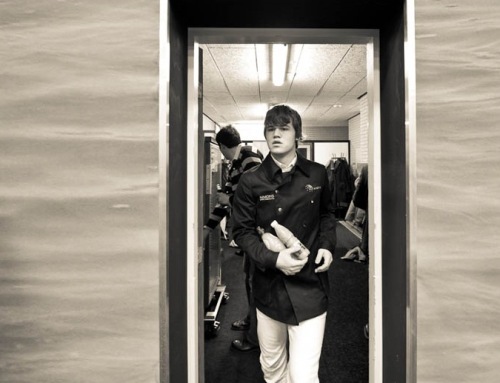 Bravo, Magnus Carlsen! Today he really was like a ruthless Terminator. The leader was destroyed in a beautiful and cruel fashion. It was a logical result, with no chances for Black. The fight for first place just got even fiercer… While this is me, Sergey Shipov, thanking viewers for following my work. Tomorrow we’ll all have a rest, and the day after tomorrow we’ll be back at the same time for the 9th round. All the best! Thanks, enjoyed it very much ! Thanks, GM Shipov (and translator). Great comments and approach to the game. I regularly read the chessbase site and saw this link in one of their reports. Since then, I have been following GM Shipov’s commentaries and they are great fun to read in addition to being educative. Thanks a lot! Or maybe he saw what was coming, and the beuaty of it, and played on just to be polite towards us, the spectators?! It’s a joy to read. Well translated!